Gone are the days when anyone should be surprised that an unprofitable company can be valued at a number followed by a long string of zeroes, but the news that Twitter is apparently worth $1 billion comes pretty close. That's the valuation put on the microblogging pioneer by new investment announced this week that raises the company's sterling value to £625 million in spite of it having no significant income and plenty of outgoings. "It was important to us that we find investment partners who share our vision for building a company of enduring value. 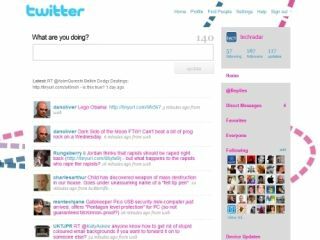 Twitter's journey has just begun and we are committed to building the best product, technology, and company possible." Twitter has plans for monetizing the site through premium services and shopping recommendations, but has yet to turn a profit in its three-year history.